Netykavka is a minimalist interactive installation. 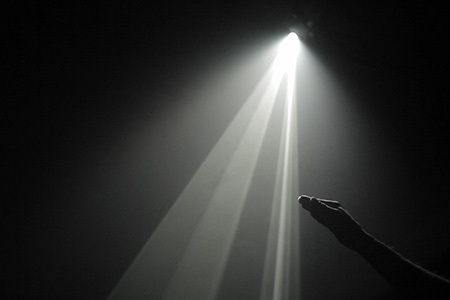 It is inspired by and pays homage to the “solid light” films of the British avant-garde filmmaker Anthony McCall. In a dark room, a geometric figure is video-projected onto the floor. This form oscillates lightly, in an almost imperceptible way. But, what calls the attention of the spectator above all, is the luminous cone created by the light coming out of the projector, which espouses and accompanies the undulations of the form on the floor. The light acquires materiality thanks to the smoke, which is sporadically released in the room. This spectral and moving sculpture intrigues, and naturally encourages the spectator to enter into dialogue with it. As we approach it, or puts out our hand to touch it, we discover its interactive dimension. The work reacts to being touched through sounds and through an instantaneous and rapid change in its form. A game is established between the work and the spectator, a dialogue through touch where the reactions of the one influence the movements of the other. Dan Gregor (1979-) is a Czech visual artist living in Prague. He is the founder of the “INITI” collective, a space for collaboration between artists, programmers, musicians, designers, etc. Together they create interactive installation projects on site, combining visual projections and sound creations with the objective of transforming real environments into virtual spaces.